The Hammock Bliss Sky Tent 2 is a tarp with an integrated bug net designed to enclose up to two hammocks for bug and rain protection. The tarp has a hexagonal design with catenary cut edges, but is made from a single piece of 75 denier polyurethane coated nylon fabric. There is no sewn ridgeline. The inner side of the tarp fabric is white. The bug net is sewn on the perimeter of the tarp, a few inches from the edge. The tarp comes with a heavy-duty 0.25 in. (6 mm.) thick ridge line that holds up the tarp from peak to peak. The rope runs the length of the tarp ridge line under the tarp and through the bug netting. The tarp is kept taut to the line thanks two some sewn-in Prusik knots on the peaks. There are four tie-outs on the corners that have a plastic loop where the cord is fastened. Entrance inside the no-see-um bug net is through an 8 ft. (244 cm.) long zipper at the bottom edge of the bug net. The floor of the Sky Tent is a durable ripstop nylon. There are two, small openings on either side of the bug net, aligned with the ridge line, for the hammock suspension to pass through. These openings can be closed with a cord lock. 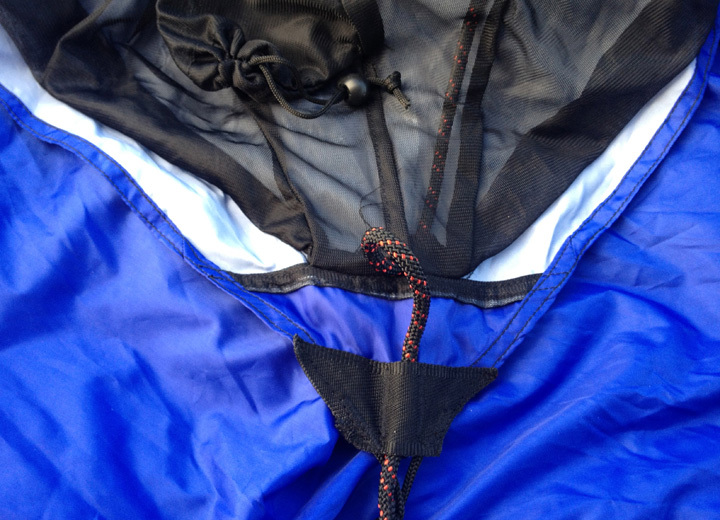 On the side opposite the zippered opening are two mesh gear pockets measuring 8 × 10 in. (20 × 25 cm.). One of the biggest advantages of this tarp design in my opinion is the extra interior bug-free space. It creates a feeling of enclosure like a tent, but keeps the visibility of a tarp (e.g., the ability to look outside the enclosure). The Sky Tent 2 enhances the original Sky Tent by adding a portal for a second hammock and a new ridge line connection. The two-hammock set-up is appealing to me because I often camp with my kids and stack our hammocks like bunk beds. One challenge with stacking hammocks, especially if they each have their own bug net, is that those integrated bug nets interfere with the hammocks, unless you hang so far above each other to be impractical. The Sky Tent solves this by enveloping both hammocks in the same enclosure. The first thing I noticed about the Sky Tent that differs from most hammock tarps I own is the full-length ridge line and prusik loops. This is an interesting design choice for a mass market item. The prusik loops are placed to allow the tarp to slide from side to side along the ridge line rope, but I wonder how many people realize this intuitively. The Sky Tent I received lacked instructions to illustrate how the ridge line adjusts with the prusiks. To me, this design is great in concept, but in practice it was hard to adjust. This was because the ridge line runs under the tarp and through a small channel where the prusik is sewn in. It is easier to pull the line through the prusik away from the tarp, but adjusting it toward the tarp is difficult because I can only pull the rope an inch or so (3 cm) at a time into the tarp. I also found the length of the ridge line short for my area. With a tarp length of 11.5 ft. (3.5 m.), I need to find trees between 13 and 15 ft. (4 and 4.5 m.) to allow enough room to tie off. An additional 6.5 ft. (1 m) of rope would be just about right. The Sky Tent 2 would benefit from using some tree-saving straps, and that would also compensate for the short ridge line. To hang two people inside the Sky Tent, I can’t pitch the sky tent with the bug net on the ground; there simply isn’t enough room for the hammocks to sag and fit. In fact, even with one person, I can’t see where pitching the bug net to the ground is very practical. The side walls of the netting are only 32 in. (81 cm. ), which isn’t very tall. And with the zipper located along the bottom seam of the floor, it isn’t very convenient either. I found that pitching the tarp with about 12 in. (30 cm.) of clearance off the ground was optimal. I finished the set-up of the tarp by staking out each corner. Once the Sky Tent is set, I put up my hammock suspension and hung my hammocks by threading the line through the openings on the end of the Sky Tent. I found that with one hammock, I could easily achieve a great sag and an optimal lay inside the Sky Tent. With one person, the Sky Tent is very comfortable and roomy and I really liked the extra space, clear from flying bugs. TWO HAMMOCKS? On a camping trip with my sons, I was excited to bring along the Sky Tent to try out the multi-hammock set-up. I was able to fit both hammocks, but I wasn’t able to get both inside with an optimal hang angle and sag. 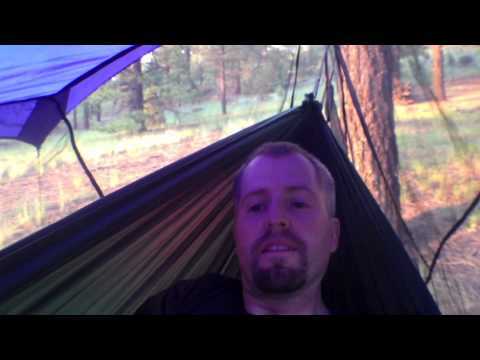 I was also using two small hammocks: the Grand Trunk Nano 7 and Anna’s Hammock. I had to pitch these hammocks fairly tight, which caused the hammocks to canoe around my shoulders. This was worse with Anna’s Hammock due to the shorter length. Part of the problem was the distance between my trees. If I could have pitched them closer, I could have set the hammocks higher and probably made it work better. Also, if I could have set up the hammocks with the right trees in a “V” configuration, I believe I could have found a better hang angle. In other words, the tight pitch was part site selection and part tarp design. As it is, both hammocks fit and we slept fine. Even with the discomfort of a tight hammock, it was night-and-day more comfortable compared to last weekend when I slept on the ground with my family in a tent (gasp!). Yes; it’s true. Don’t tell anyone. In this test, I took the top “bunk” so I could have an unobstructed view to read stories to my kids. I hung a lamp from the ridgeline (handy!) and had plenty of head room for the book. I loved the large, bug-free space inside. Am I repeating myself here? 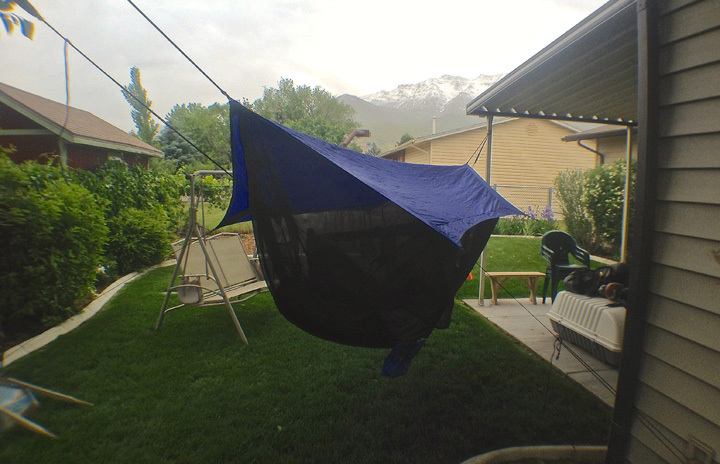 Tarp Size—When I first tested the Sky Tent, it was in Northern Utah, and I hung only one hammock inside. The fit for the hammock was perfect. I was easily able to get a good sag and lay in the hammock. With storms in the forecast, I worried about the “small” tarp. The tarp is only about 2.5 ft. (74 cm.) on each side! I spent several days camped in the Sky Tent and it rained nearly every night, and in some cases, in monsoon conditions. I am happy to report that the tarp worked fine in repelling the rain. That said, I think I’d prefer a slightly larger tarp, especially for two hammocks inside. The Sky Tent is currently made from a single piece of fabric so there is no sewn ridgeline. Adding a few feet on either side would not only create a more spacious interior (to allow two hammocks to hang side-by-side! ), but also provide more storm worthiness in more challenging conditions. Unfortunately, in a two-hammock set-up, the lower “bunk” is less protected than the upper “bunk” as it is more exposed to diagonal rain. Inside, the tarp material is white. I found this to be a great addition at night when I was reading because a little light reflected to a wide area. This hidden feature also made the interior feel bigger than it was. Now that I’ve tested the stock version thoroughly, when I take it out again, changing out the ridge line will be my first order of business. I’m not sure how I will tie on the prusik loops as they are sewn onto the tarp. What I will probably end up doing is running the ridge line over the tarp and using the current prusik loops as loops and adding my own prusik knots and connectors. I may also remove the stuff sack and use it separately. 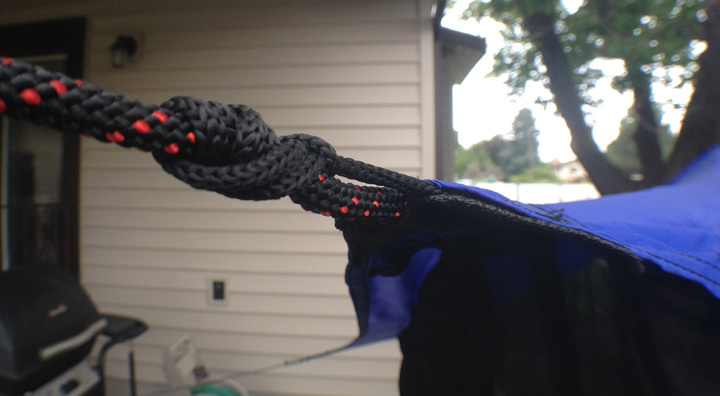 Having the integrated stuff sack is convenient, but it is placed at the bottom of the bug net and ends up dragging in the ground, increasing the potential for damage and collecting grime and water. I think the Sky Tent is perfect for one hammock, and two in a pinch, however, I think the tarp is a little small for two hammocks and the bug netting is too short to get both to hang properly inside. I’d love to see the Sky Tent 2 modified a little more to make a two-person hang a little more comfortable. At 3 lbs. (1.4 kg. ), the Sky Tent is a heavy for solo backpacking, but the weight is mitigated by the spacious interior. For two people, the weight savings is tolerable. For me, I intend to take the Sky Tent on future family car camping trips where I can afford the extra weight and have the enhanced interior bug-free space. I spoke with Dov and he reminded me that, according to the hang tag, the larger, heavier person should sleep on the bottom “bunk” with the lighter person on the top hammock. Sleeping in opposite directions (like an “X”) with heads and feet on opposite sides also helps. I should have mentioned these before as I agree with both statements. I typically sleep in the bottom hammock when I bunk them like this, but I wanted to give it a try (plus, it was roomier and better to read a book!). Did you ever replace the ridge line? If so, how did it work out? It’s really easy to replace. After consideration I think the other thing I would recommend is to use webbing straps and tie the ridge line to the strap instead of directly to the tree. 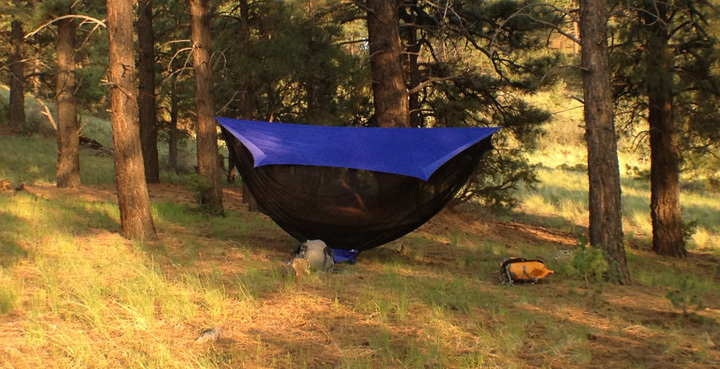 The Nube hammock is just a kit with a generic hammock and a specialized tarp that has the bug net sewn on the perimeter. It takes cool photos but I wouldn’t get too excited about it. The cool thing about the Nube is that the bug net can be rolled out of the way. The Sky Tent seem like better bang for your buck though. Yes. As long as you hang the hammock with a good sag.